March 24, 2014, 11 a.m.
Five journalism professors from historically black colleges and universities will participate in a program also aimed at increasing newsroom diversity. By Joseph Lichterman @ylichterman March 24, 2014, 11 a.m.
Before joining the faculty of Savannah State University last year to teach multimedia journalism, Jessica Sparks had spent her career working for local, community news organizations like Bluffton Today in Bluffton, S.C. But this summer, Sparks will have the opportunity to work in the newsroom of a slightly larger outlet: The Wall Street Journal. Sparks is one of five journalism instructors who will have their own internships of sorts as part of the initial class of Back in the Newsroom, a program run by the International Center for Journalists that aims to improve instructors’ digital journalism skills while also fostering diversity in newsrooms. It’s an effort to better align what students are learning and the real-world demands of today’s news business. The program, which will initially focus on professors from historically black colleges and universities, is funded by a $183,000 grant from the Knight Foundation (disclosure: Knight also supports Nieman Lab), and The Wall Street Journal, USA Today, The Los Angeles Times, CNBC, and The Washington Post are the participating news organizations. The profs will all have a two-day orientation in Washington with ICFJ and then spend about nine weeks this summer in their respective newsrooms, where they will focus on operational areas like multimedia reporting, data-based reporting, social media, and more. After the professors head back to campus in the fall, ICFJ plans to check in with them periodically to see how they’ve implemented their programs and whether the summer in the newsroom changed their approach toward teaching. With that feedback, ICFJ, Knight, and the participating news organizations will look at whether to continue the program and how to possibly expand it to additional universities and newsrooms while making it self-sustaining. 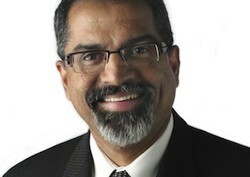 Raju Narisetti, News Corp’s senior vice president for strategy and an ICFJ board member, was influential in bringing the proposal to Knight; Knight saw Back in the Newsroom as a way to advance its efforts in encouraging newsroom diversity and further its work with historically black colleges and universities, said John Bracken, Knight’s director of journalism and media innovation. While minorities make up about 37 percent of the U.S. population, only 12.37 percent of the journalists in today’s newspaper newsrooms are racial minorities, according to the American Society of News Editors’ latest survey of newsroom diversity. By focusing the program on historically black schools, the ICFJ and participating news organizations hope they can reach a more diverse pool of aspiring journalists. And the participating instructors, a number of whom who have not worked in a newsroom for several years, also said that they hope to use their time in the program to gain skills and build relationships that will ultimately help their students. Sparks will work with the Journal’s real-time news desk, “the desk where everything comes together,” said Michelle LaRoche, the Journal’s editor for development. Staffers there write, edit, and publish news for the Journal’s newswires, website, and apps. And she’s not going to be there just to observe, LaRoche said. She’ll be an active member of the team that deals with breaking news on a daily basis. The instructors all stressed the importance of what they’ll be able to take back to their students. Each will have to develop a project during their fellowship that they will then implement in their classrooms when they get back to campus next fall. Morgan State University professor Jerry Bembry, who will work on USA Today’s video team, is still developing his plan, but said he would like it to include his students producing videos that will be published on USA Today’s website. Similarly, Howard University’s Yolanda McCutchen’s background is in broadcast news, having worked for Dateline before joining the faculty at Howard in 2013 [Update: not 2009 as we originally posted here]. But this summer, she’ll work for The Washington Post, attached to the Post’s video team for half the summer, and she said she hopes to use the experience to demonstrate to her students that there are broadcast opportunities outside of traditional television. “You may not be breaking in at a news station, but you’re still doing news, but for what used to be a traditional print outlet,” she said. 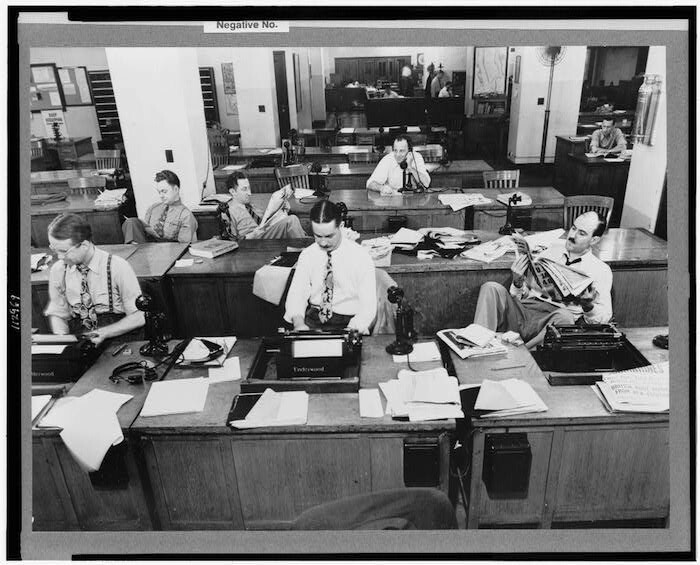 Photo of The New York Times newsroom in 1942 from the Library of Congress. POSTED March 24, 2014, 11 a.m.
Lichterman, Joseph. "Back to the newsroom: A new program lets professors go back to the thick of today’s news work." Nieman Journalism Lab. Nieman Foundation for Journalism at Harvard, 24 Mar. 2014. Web. 18 Apr. 2019. Lichterman, Joseph. "Back to the newsroom: A new program lets professors go back to the thick of today’s news work." Nieman Journalism Lab. Last modified March 24, 2014. Accessed April 18, 2019. https://www.niemanlab.org/2014/03/back-to-the-newsroom-a-new-program-lets-professors-go-back-to-the-thick-of-todays-news-work/.